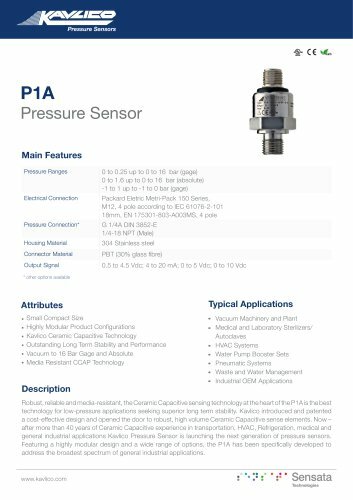 P1A Pressure Sensor Main Features Pressure Ranges Electrical Connection Pressure Connection1 Housing Material Connector Material Output Signal * other options available 0 to 0.25 up to 0 to 16 bar (gage) 0 to 1.6 up to 0 to 16 bar (absolute) -1 to 1 up to -1 to 0 bar (gage) Packard Eletric Metri-Pack 150 Series, M12, 4 pole according to IEC 61076-2-101 18mm, EN 175301-803-A003MS, 4 pole G 1/4A DIN 3852-E 1/4-18 NPT (Male) 304 Stainless steel PBT (30% glass fibre) 0.5 to 4.5 Vdc; 4 to 20 mA; 0 to 5 Vdc; 0 to 10 Vdc Attributes Typical Applications ■ Vacuum Machinery and Plant ■ Medical and Laboratory Sterilizers/ Autoclaves - HVAC Systems ■ Water Pump Booster Sets - Pneumatic Systems ■ Waste and Water Management ■ Industrial OEM Applications • Small Compact Size . Highly Modular Product Configurations • Kavlico Ceramic Capacitive Technology • Outstanding Long Term Stability and Performance • Vacuum to 16 Bar Gage and Absolute • Media Resistant CCAP Technology Robust, reliable and media-resistant, the Ceramic Capacitive sensing technology at the heart of the P1A is the best technology for low-pressure applications seeking superior long term stability. Kavlico introduced and patented a cost-effective design and opened the door to robust, high volume Ceramic Capacitive sense elements. Now -after more than 40 years of Ceramic Capacitive experience in transportation, HVAC, Refrigeration, medical and general industrial applications Kavlico Pressure Sensor is launching the next generation of pressure sensors. Featuring a highly modular design and a wide range of options, the P1A has been specifically developed to address the broadest spectrum of general industrial applications.